Dalmatian Toadflax is a member of the Snapdragon or Figwort Family. It grows to a height of 4 feet and has bluish green, broad, leathery leaves which grow from the stem at regular intervals to 3 inches in length. The plant typically grows along roadsides and in fields at elevations between 5500 - 7500 feet. Dalmatian Toadflax is originally from Eurasia, but has become naturalized to the southwest US. 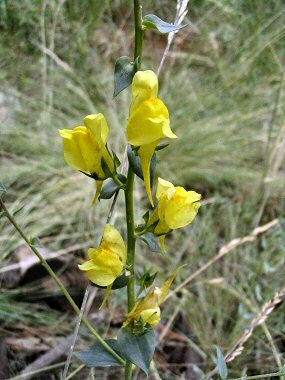 Dalmatian Toadflax typically blooms between May - September and produces yellow, snapdragon-like flowers which have a long spur that grows from the base.